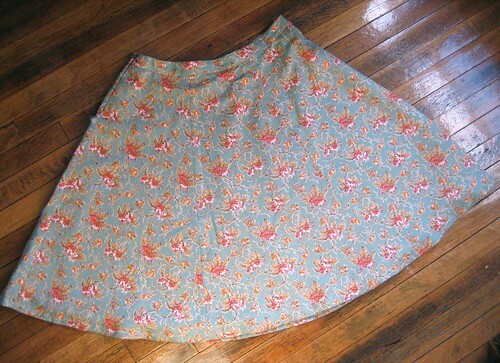 I made this skirt from some yardage I had in my stash, bought years ago in a thrift store. The lining fabric was also from my hoard, as was the interfacing and thread. I did have to buy the zipper – for 75 cents. I used a Burda magazine pattern but because the panels were too large for my fabric I drafted a version with 6 smaller panels instead of 2 large. That worked out really well. I alternated the grain direction and the fabric hangs beautifully. I can’t decide whether the skirt looks cute or like drapery. M likes it; my jury’s still out. This entry was posted on Monday, November 12th, 2007 at 9:25 pm	and is filed under sewing. You can follow any responses to this entry through the RSS 2.0 feed. You can leave a response, or trackback from your own site. I agree with Eliza, I would like to see it on. I don’t think the fabric looks like drapery at all. I like the skirt AND your floor! I love it! I think the fabric is quite cute, great job! Yup, me too, I want to see it on! It does not look like drapery, and I am curious what color the lining is etc…You could wear a big bulky sweater with it and army boots… FUN! Drapery looked great on the von Trapp kids, maybe the two can co-exist for you? I’ll try to get some pictures of it on, but if I’m aiming for the Von Trapp look, I’ll need to make a matching blouse first.